Anodised finish keeps dirt off hands. Large platform gives stability in use. 12 point joints and heavy corner reinforcement. Platform W x D: 400 x 220mm. EN131 compliant, 150kg load capacity. Gaining access to high up areas to either get an item or conduct a work task will require a reliable set of steps. The heavy duty aluminium step stools, from Slingsby, provide a great way to keep the user stable and comfortable while working at height. 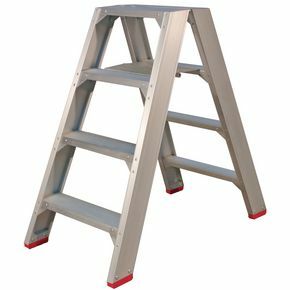 There is a large platform at the top of the steps giving stability when in use and the anodised finish keeps dirt off the user's hands. They have 12 point joints and heavy corner reinforcement for durability and 100mm deep treads for the user's comfort. They comply with EN131, so you can be confident about their quality and they have a capacity of 150kg. There are three platform heights to choose from; 450mm, 700mm or 950mm. Our heavy duty aluminium step stools are a great way to access hard to reach areas and they come with a 36 month guarantee and FREE UK Delivery.